The average tax paid in California amounts to $18,438 for 6.1 million returns of state residents who itemized deductions in 2015. And that adds up to a mountain of money — 6.1 million multiplied by the lost $8,438 in deductions is $51.5 billion. So we will, at last, see just how generous Californians really are in their Democratic beliefs that everyone should pay higher taxes. The dishonesty of politicians in California knows no bounds. Naturally, there is no discussion whatsoever of reducing the tax burden for residents by reducing the cost of government. OMG! How dare someone even utter those words in a state that wants to tax per mile a space launch travels above the state. State Senate President Pro Tem Kevin de León, D-Los Angeles, proposed to set up a state charity named the California Excellence Fund which would allow taxpayers to donate to it get a 100% credit on state income taxes. Since Trump’s federal taxes doesn’t impose limits on charitable deductions, the scheme would, in theory, allow Californians to lower their federal tax obligations while paying the same amount in state taxes. Ah! Brilliant! The problem would be that this could alter the definition of charity and result in the Feds eliminating real charities to circumvent California’s latest scheme. The truck rental business is a leading indicator of net migration. There is a shortage of trucks for rent to get out of California. The rates can be 300% higher to rent a truck for one-way trips out of California v trips into the La La Land of endless taxes. Seven U.S. states currently don’t have an income tax: Alaska, Florida, Nevada, South Dakota, Texas, Washington, and Wyoming. And residents of New Hampshire and Tennessee are also spared from handing over an extra chunk of their paycheck on April 15, though they do pay tax on dividends and income from investments. 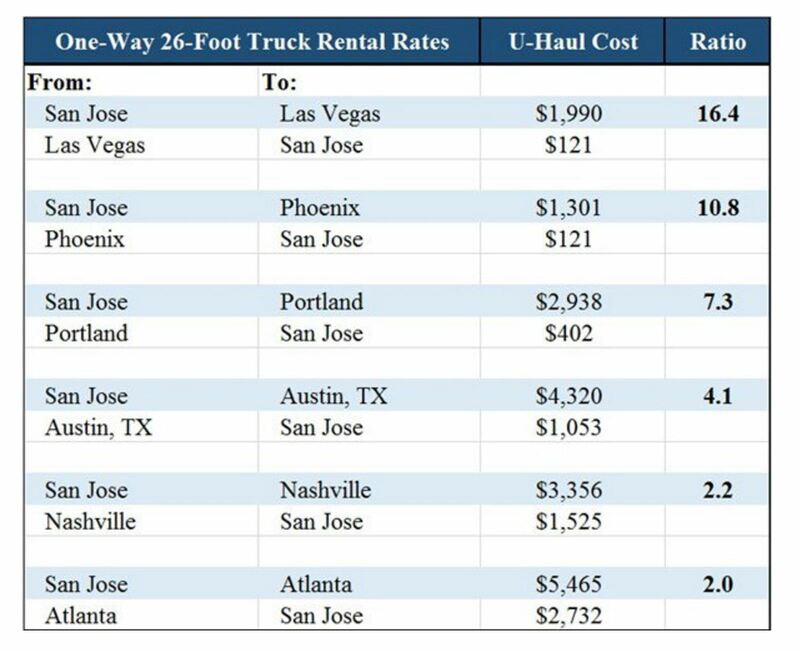 The number one place Californians are migrating to is Nevada with the truck rental ratio at 16.4:1 leaving California. Real estate is starting to decline in the high tax states and it is flat to rising in non-income taxed states. California has surpassed some of the most socialistic taxed countries in Europe and they get even less. So where does the money go? Into the pension for state employees. CalPERS is still underfunded, and it is a $345 billion pension fund has been collecting more money from employers. In 2016, CalPERS paid out $20.5 billion in benefits – $4 billion more than it earned, according to its annual financial report. Sacramento Mayor Darrell Steinberg, seen here delivering the State of the City address on Jan. 18, wants to raise sales taxes to cover pension costs that are rising. The pension crisis will simply bankrupt the State and politicians refuse to address the problems. Gov. Jerry Brown and Treasurer John Chiang have cooked up an idea to borrow $6 billion from the state’s Pooled Money Investment Account and spend it on an extra payment to the CalPERS — that is, make an advance payment to CalPERS for pensions. The idea was aired by Brown in his May 2017 budget proposal. In January 2017, Jerry Brown wanted a 42% increase in gas taxes to bailout CalPERS. All of these schemes are only to help government employees – not the poor on the street in some magnanimous social caring effort. The question becomes, when will the sheet be pulled off the Democratic agenda laced with class warfare pretending this is for the people when it is for the government? 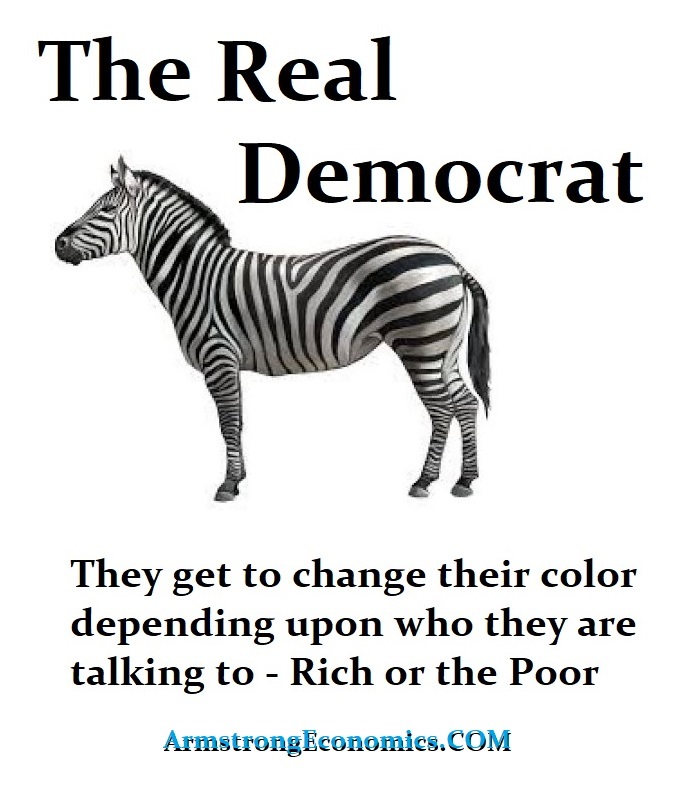 A real Democrat is not a Donkey – it’s a Zebra, like Hillary who said you say one thing publicly and another privately. 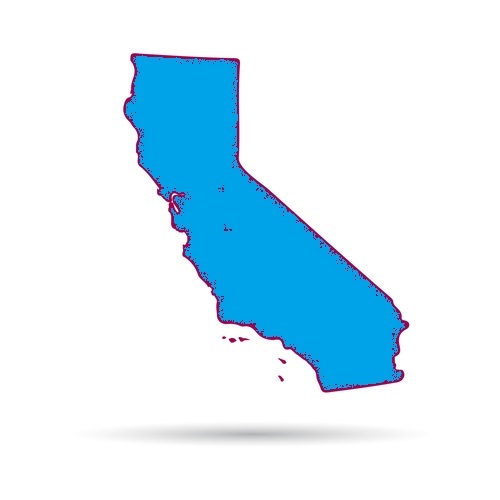 California became a State on September 9th, 1850. When will California break away from the USA? The window opens in 2022.